Police in the Urals city of Ekaterinburg are chasing down an escaped crocodile after several people spotted the reptile about town. So far, no one is admitting to prior ownership of the runaway predator. On Wednesday morning, a local man called the police, saying that he saw the creature heading for the Iset River, which runs through Ekaterinburg, Russia’s fourth-biggest city. While police would normally be skeptical about sightings of reptiles within city limits, the report was independently confirmed by a local patrol. A police team has been dispatched, but the crocodile reportedly dived into the river upon seeing the officers. 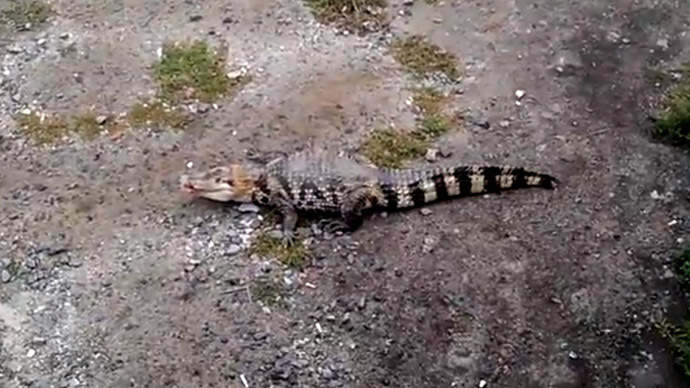 Several videos have been uploaded to YouTube showing a somewhat sluggish, 1-meter-long creature in an urban environment. Darya Zmeyeva, a reptile expert from the local zoo, identified the creature as young Nile crocodile. When fully grown, an adult male can reach a length of 5 meters, and weigh more than 500kg. The relatively common species kills several hundred people annually. “The circus is the likeliest place from which the animal escaped. But there are also pet shops and private owners. The animal might have been just going for a walk with his handler. The police are looking at all versions,” a police representative told local media. 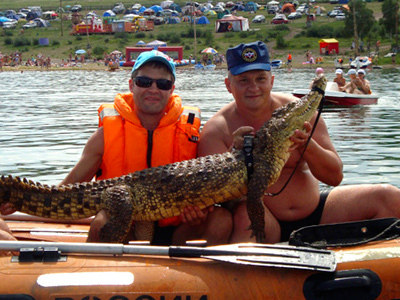 The circus has denied that the fugitive animal is Pasha, a crocodile that appears in its shows. “Pasha has a show on Saturday. We keep him in an aquarium in a special room. To escape, he would have to climb out of it, unlock the room, then pass through half of the circus unnoticed, before passing through the security barrier,” said Natalya Kazantseva, a spokeswoman for the Ekaterinburg Circus. “His job in the circus is as a crocodile, not an escape artist,” she said. A nearby crocodile farm, where the species is grown in captivity for its leather, also claims it has no missing animals. It is also possible that the pet was kept by a city-dweller, which is not illegal in Russia. TV reports in the country often show exotic animals kept in bathtubs of tiny Soviet-era apartments, but there are no statistics on the overall number of privately-owned crocodiles. Previous cases have seen owners attempt to surreptitiously dispose of their predator pets, when they grow too big and dangerous for the confines of a city flat. Local zoo experts have given conflicting predictions for the survival chances of the runaway croc, providing it isn't captured in the police hunt. An unnamed expert at the zoo told the Uralinformbureau website that the crocodile, whose blood temperature is dependent on the environment, is likely to be too cold to move rapidly, and would not survive in the chilly and polluted Iset River for longer than two or three weeks. The biologist said the animal was likely stressed, and will try to lay low at the bottom of the river until it calms down. But another reptile expert said the animal could fare better – if it is lucky enough to encounter edible prey. 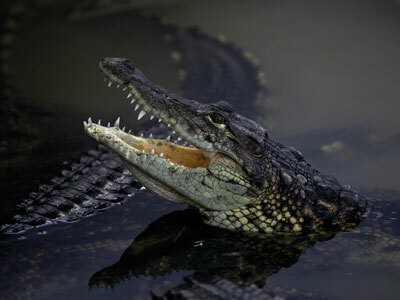 “In our climate the crocodile can feed on fish, otters, and even a dog or a cat, if they come close enough to the water. The key is for the crocodile to find a warm sewage pipe to live in. There he can survive for a year or two, or perhaps his normal lifespan,” Zmeyeva said. 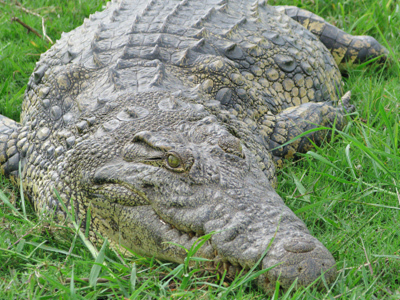 In the Nile, crocodiles can survive for up to 100 years. But if the stray is found, he will be welcomed into a new home, Kazantseva said. The 'Iset Crocodile' has already acquired its own Twitter feed, detailing its adventures in an unfamiliar environment.